So, before you say anything, I did write as I said I would but I am just now blogging it. Enjoy! Writing Prompt 2: A picture is more than a blank page. (Disagree!) Pick a photo from your photo album (in your phone) and meditate on how it makes you feel. This is my boy, Zander. A Siberian Husky. One blue eye, one brown. This dog, as everyone knows, is my dog. My boy. My brother was maybe four of five years old and he had asked my mother for some “monies.” She gave him a jar of pennies. He took the pennies and bee-lined it to the quad that separated our townhouses to the park. But sitting in the quad was a man we’d not seen before in our neighborhood and his cardboard box. My brother met the stranger, with complete confidence of his actions, and put three pennies on the man’s thigh. He counted them: One. Two. Three. He then scooped down in to the cardboard box and picked up, incidentally, three-day old collie-boxer puppies. Three monies. Three dogs. It was simple math, really. Not sure if he thanked the man or just turned on his heel and headed home. That’s where I came in. He still does this now, but my brother doesn’t ring the door bell once. Ding-ding-ding-ding-ding-ding-ding-ding-ding-ding-ding-ding! I open the door to find him with three pups in his arms. I, being an older sister and a first born, think the worst. I’m sure I scowled him and took the dogs from him and returned them to the man in the quad. But we found him laughing; tears streaming down his cheeks. The afternoon was spent with the, we learned, the brother of our neighbor and, more importantly, his unexpected puppies. 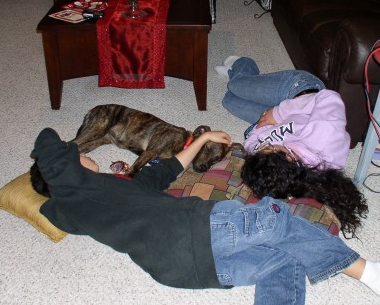 I didn’t anticipate that we would get a dog that day and I recall mentally preparing myself that it wouldn’t happen. Dad got home from work and he scooped up one brown and white dog with an almost lightening bolt down her back. Her eyes were closed. Then she started to suckle on his shirt. He was done. We named her, of course, Penny. When Penny passed we were heartbroken. Non-dog owners couldn’t understand. I was convinced that we needed another dog and we rescued Holly. Holly, Our Rebound Dog Or …? Look at that picture for a minute and tell me we didn’t need another dog. Could Holly replace Penny? No. But we needed a dog. And Holly, as quirky and unique as she is, needed us. While Holly’s story may not be as adorable’s as Penny’s homecoming, her personality is all her own: How she scolds my father if he does not share his wasabi peas — and I’m talking actual growls and grumbles — how she jumps in to my parent’s bed when their is lightning and how she found a litermate with my brother. If he’s running around, which I know he still does, she’s chasing ’em. Now I tell you that Holly is my mom’s dog. They have a connection and the family knows it now. Before it was always the question of when I would be taking “my” dog to Arizona. Nice roundabout but that brings us back to the first photo and the questions that sprung forth when I stare at it. Does Zander have eyes for me? Do dogs feel a kindred connection with humans? Their owners? I’ve read arguments on both sides — about dogs that have protected their owners for no immediate gain on their part, dogs that mourn their owners when they pass but I also understand that dogs are biologically-wired to be our “best friend” so we’ll care and feed for them. But when I look at this photo I should note that there is no food in my hand. 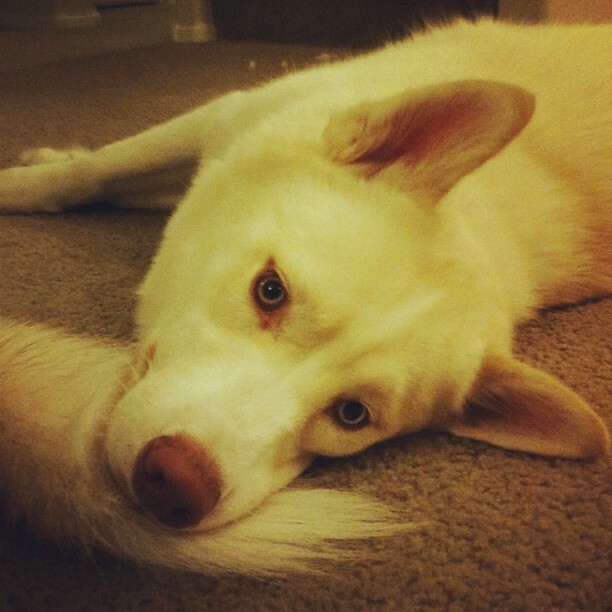 His head is resting on Saskia’s tail and his eyes are looking straight at me — his own brown eye; his one blue eye. Its not a look of curiosity — they know too well my aptitude to stick my phone and its camera in their snouts. Maybe its just contentment and he is saying “I see you.” And by I see you, I acknowledge your presence in my life. And maybe that’s as close to “I love you” as I’ll get. And I’ll take it. I smother him enough for the both of us. And besides, I don’t think he minds as he knows a treat isn’t far behind.